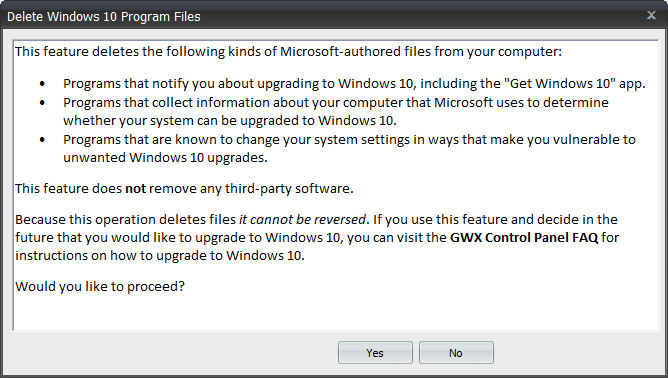 I have already shown you, not once but twice, how to get rid of the GWX popups offering free upgrades to Windows 10. You do that by assuming ownership of the namesake folder and files, changing their permissions, and then either deleting or renaming the objects. Then, we followed up with some registry tweaks and such. Advanced work, mostly. But what if you're not comfortable with the steps above? You do not want to manually tamper, and that's a perfectly legitimate point of view. But you still do not wish to have that popup. To wit, let me introduce a tool called GWX Control Panel. Follow me. This is a very simple tool. You can install it, or run it as a standalone program. Fire it up, accept the disclaimer, and then take a look at what the main interface offers. There are not too many options, but it is worth spending a few moments learning before you do any clicking. The top part of the panel is informative. 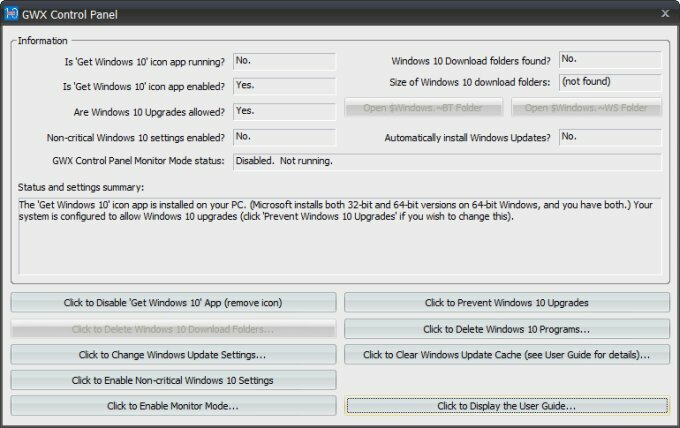 It will tell you whether you have the GWX tool installed, whether it's running, and what kind of Windows Update settings you have. The bottom half will let you change system settings. First, you can just kill the process. Then, you can also change Windows Update settings, but they are not strictly related to GWX. 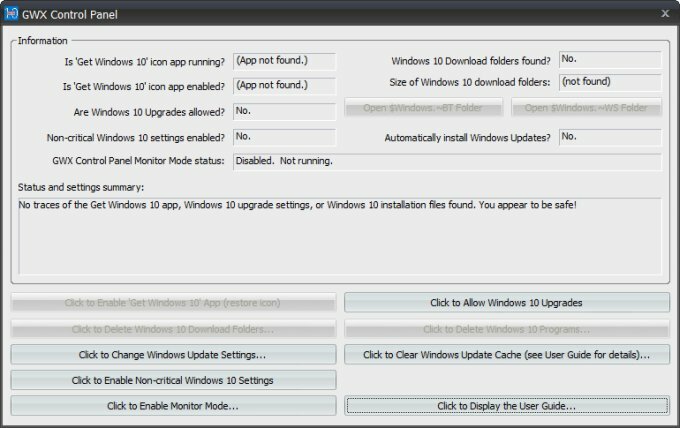 However, if you have installed KB3035583, and you have automatic updates, Windows may actually download some 3-4GB worth of Windows 10 installer files and place them in a hidden folder on your C: drive. The GWX Control Panel lets you delete these. You can also enable/disable non-critical updates. This refers to recommended updates, which are normally given as optional updates when you run WU. To be precise, GWX is one of these, and you will not get it if you don't allow recommended updates to be shown alongside critical security fixes. Then, you can also prevent Windows 10 upgrades completely, totally, utterly - this is done by installing an additional patch, and then setting some group policies or registry tweaks. Mind, this is not a task for new users, but you are more than welcome to read and learn how this can be done. Lastly, you can delete Windows 10 related offers. This is a destructive no-go-back operation, so you might want to be extra careful. I know I'm repeating myself, but then, system imaging and backups are always a good idea. And if you change settings, GWX will be gone. The options that have been applied will be grayed out. This will help you better understand what you have done, so you do not just randomly click things. As always, applying tweaks blindly is dangerous, especially if you do not fully understand the implications. Therefore, double-check yourself, and make sure you know the effect of your mouse actions. But that's it, job done! 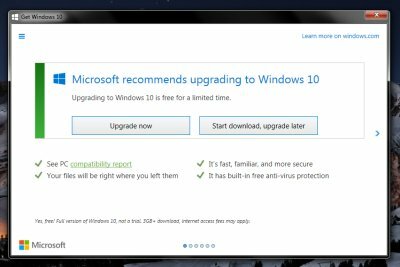 Windows 10 upgrade - do you really want or need it? Windows security updates & ads - is this happening, and what now? GWX Control Panel abstractizes the magic of several geeky commands and operations behind its simple one-page wizard view. This allows people with less tech savviness to disable the annoying Windows 10 upgrade offers on their systems. The manual methods are still 100% applicable. And there you are. You now have even more freedom and more choice in how you govern your system, especially if you are unhappy with how Microsoft manages this campaign, and/or if you have no interest in upgrading to Windows 10. GWX Control Panel does the necessary job. Hopefully, you have learned something new. Still more to come. Take care.